Does someone in your family have osteoporosis (thinning of the bones) or a history of hip or vertebral fracture? According to the National Osteoporosis Foundation, one in two women and one in four men over age 50 will have an osteoporosis-related fracture in their lifetime. Osteoporosis can develop when the natural microscopic remodeling process inside bones, which normally consists of constant extraction and replacement of calcium, is disrupted. It is crucial to perform a careful interview and physical exam, followed by a state-of-the-art screening test (“DEXA” test), which Arise Infusion Therapy Services has on-site for your convenience. This will clarify if your bones are healthy, or if you have osteopenia (a milder form of bone thinning) or osteoporosis. Also, simple blood tests can make sure your calcium and vitamin D levels are normal. In the recent past, most women and many men with low bone density were all treated with the same kind of medicines. Now, we can treat each person individually. The first step would be to determine your risk of breaking a bone by comparing your DEXA results with established national statistics. If you have a higher risk, you should discuss with your physician and understand all three categories of medications that are now available. The decision of which medication is best for you should be determined, along with other adjunctive treatments such as supplements, diet and exercise. The oldest class of medications called “bisphosphonates” includes Fosamax, Actonel, Boniva and Zolendronic Acid (Reclast). This family of drugs slows down the natural extraction of calcium from be by osteoclasts (“bone eating” cells). Reclast and Boniva can be given conveniently through an IV once a year (Reclast) or quarterly (Boniva), so that you can avoid taking pills. Prolia (denosumab), another type of medication for osteoporosis, also blocks the “bone eating” cells and is given just twice a year as an injection by our nurses. A third class of medication includes Forteo (teriparatide) and Tymlos (abaloparatide). These medications supplement one’s natural parathyroid function and are self-administered daily injections, like insulin. 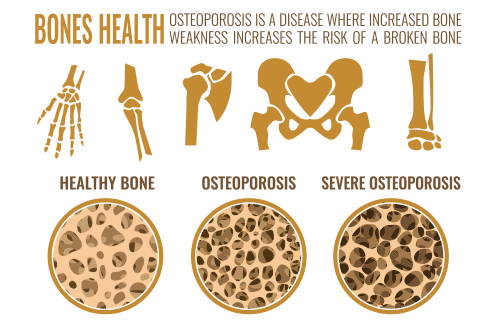 For additional information please visit National Osteoporosis Foundation.